Preprints (earlier versions) of this paper are available at http://preprints.jmir.org/preprint/6256, first published Jun 23, 2016. Background: Use of social media is becoming ubiquitous, and disease-related communities are forming online, including communities of interest around diabetes. Objective: Our objective was to examine diabetes-related participation on Twitter by describing the frequency and timing of diabetes-related tweets, the geography of tweets, and the types of participants over a 2-year sample of 10% of all tweets. Methods: We identified tweets with diabetes-related search terms and hashtags in a dataset of 29.6 billion tweets for the years 2013 and 2014 and extracted the text, time, location, retweet, and user information. We assessed the frequencies of tweets used across different search terms and hashtags by month and day of week and, for tweets that provided location information, by country. We also performed these analyses for a subset of tweets that used the hashtag #dsma, a social media advocacy community focused on diabetes. Random samples of user profiles in the 2 groups were also drawn and reviewed to understand the types of stakeholders participating online. Results: We found 1,368,575 diabetes-related tweets based on diabetes-related terms and hashtags. There was a seasonality to tweets; a higher proportion occurred during the month of November, which is when World Diabetes Day occurs. The subset of tweets with the #dsma were most frequent on Thursdays (coordinated universal time), which is consistent with the timing of a weekly chat organized by this online community. Approximately 2% of tweets carried geolocation information and were most prominent in the United States (on the east and west coasts), followed by Indonesia and the United Kingdom. For the user profiles randomly selected among overall tweets, we could not identify a relationship to diabetes for the majority of users; for the profiles using the #dsma hashtag, we found that patients with type 1 diabetes and their caregivers represented the largest proportion of individuals. Conclusions: Twitter is increasingly becoming a space for online conversations about diabetes. Further qualitative and quantitative content analysis is needed to understand the nature and purpose of these conversations. Use of social media is becoming ubiquitous among US individuals; according to the Pew Research Center, at least 76% of adults who are Internet users use some form of social networking site such as Facebook or Twitter . Surveys have shown that 7 out of 10 US adults with chronic diseases are (1) looking online for health information about medical problems, treatments, and drugs; (2) consulting online reviews about treatments; and (3) learning about others’ personal health experiences . Although Facebook is still the most popular social media channel, use of additional social media channels in the US population is increasing; for example, in 2014 an estimated 23% of online adults reported that they use Twitter . In particular, patients and caregivers with diabetes started to congregate and participate in online conversations about diabetes on Twitter , engage in virtual communication and sharing, and find peer support online. There is growing interest in studying disease-related communities of interest online. Studies in the scientific literature have analyzed content of a small number of tweets within a short time period; for example, studies have looked at the use of Twitter by local health departments for dissemination of information about diabetes [5,6] and have performed content analysis and user profile classification with hundreds of diabetes conversations on Twitter [7,8], but we are unaware of research studies that have formally tried to perform large-scale evaluation of Twitter metrics among communities of interest focused on diabetes. Our objective was to examine diabetes-related participation on Twitter by describing the frequency and timing of diabetes-related tweets, the geography of tweets, and the types of participants over a 2-year sample of 10% of all tweets. The results will help us better understand the extent to which patients, caregivers, and medical practitioners participate in social media discussions related to diabetes. We used a dataset that contains 29.6 billion tweets obtained during 2013 and 2014 collected through the Twitter stream application programming interface (API) with Gardenhose access, which collects 10% of all public communications on Twitter (secured through a formal agreement with the University of Michigan School of Information). We identified tweets with diabetes-related search terms and hashtags based on suggestions from providers and patients in the diabetes community using the following query terms and hashtags: “glucose,” “blood glucose,” “diabetes,” “insulin pump,” “insulin,” “#diabetes,” “#t1d,” “#type1diabetes,” “#type1,” “#t2d,” “#type2diabetes,” “#type2,” “#bloodsugar,” “#dsma” (Diabetes Social Media Advocacy is an online advocacy group which holds a weekly “tweetchat” to provide peer support to individuals with diabetes), “#doc” (diabetes online community), “#bgnow” (blood glucose now, in which individuals share their blood sugars), “#wearenotwaiting” (a phrase coined by the diabetes community related to the need for rapid access to technology solutions), “#showmeyourpump” (a tweet campaign that occurred when a Miss America contestant decided to wear her insulin pump visibly), “CWD2014” (children with diabetes, a diabetes conference for children and families with diabetes), “dblog”(diabetes blog), and “diyps” (a do-it-yourself artificial pancreas project). For each tweet retrieved, we extracted its text content, the username of the tweet, the tweet’s posted date and time, the geolocation information of the tweet if available, and whether the tweet is a retweet. We assessed the frequencies with which the retrieved tweets are used across different terms and hashtags. With the posted date information of each tweet, we examined the trend of volume of extracted tweets in each month. We conducted an analysis with 2 subsets: all users with a diabetes-related tweet and users who posted at least once with the #dsma hashtag. We then examined the identities of two subsets of users. We randomly sampled 500 users from the entire dataset. There were 1424 individuals who had tweeted at least once with the hashtag #dsma; we chose to focus on a smaller subset, those who had tweeted at least 3 times with hashtag #dsma (n=416), because it would identify more active members of the community and it represented a sample similar in number to our overall diabetes sample. A medical student reviewed each of the Twitter profiles to identify individuals’ relationship to diabetes, which was categorized into one or more of the following 15 categories: physician, nurse, dietitian, diabetes educator, researcher, individual with type 1 diabetes, individual with type 2 diabetes, individual with diabetes not specified, caregiver/parent/guardian of an individual with diabetes, spouse/significant other of an individual with diabetes, friend of an individual with diabetes, individual who works with a diabetes-related company, health care organization, diabetes medical/device company, and other/unknown. A second individual reviewed another 50 randomly selected profiles for both subsets of users. There was interrater agreement on 44 of the 50 categorizations for the all-user subset. The Cohen kappa was .58. In the subset of #dsma users, there was interrater agreement on 40 of the 50. The Cohen kappa was .71. Of the 29.6 billion tweets in our entire dataset, there were 1,368,575 diabetes-related tweets, based on the selected diabetes terms and hashtags. One-third of these tweets (454,261) were retweets. Table 1 shows the number and percentage of tweets and the number and percentage of users tweeting with specific search terms or hashtags in our dataset. The most common tweets were the terms including the term or hashtag diabetes, followed by insulin and glucose, and then finally references to the type of diabetes (ie, type 1 or type 2 diabetes). Table 1. Number and percentage of tweets by terms or hashtags and the number and percentage of users tweeting with those terms or hashtags. Figure 1 shows the monthly breakdown of diabetes-related tweets over the 2-year period. The peak occurred in November 2013 on World Diabetes Day, with over 70,000 diabetes-related tweets (representing 10% of tweets). Figure 2 shows the total number of tweets for community using the #dsma hashtag. Both figures show increasing trends of the tweets volume. Figure 3 shows the monthly distributions of diabetes-related tweets, which were most frequent in November, likely attributable to World Diabetes Day. For tweets using the #dsma hashtag, Figure 4 shows January had the largest proportion. Figures 5 and 6 show that the proportion of diabetes-related tweets was higher during the weekdays compared with the weekend days; mean tweets per weekday were significantly higher than for weekends (2011 per weekday vs 1684 per weekend, P<.001). In contrast, the majority of #dsma tweets were posted on Thursdays (Twitter API returns coordinated universal time) due to the fact that there is an online chat organized by a community of individuals with diabetes and caregivers that uses the #dsma hashtag for participating in the conversations at 9 PM eastern standard time every Wednesday night. Approximately 2% (26,763) of tweets carried geolocation information. Table 2 shows the number of geotagged tweets for countries with at least 100 geotagged tweets, which would likely bias toward English-speaking countries because of our query terms. The United States ranked first, followed by Indonesia, United Kingdom, Venezuela, and Mexico. Figure 7 displays the locations of the geotagged tweets on a world map. For the United States, the participation appeared to be located particularly on the east coast and midwest with pockets on the west coast. Of the 500 users randomly selected from the diabetes-related tweets, 471 of them were categorized as other/unknown. Table 3 shows the breakdown of categories. There were just 29 users for whom an identity could be assigned, including 12 health care organizations and a handful of patients with type 1 or type 2 diabetes and health care providers. In contrast, only 15.6% of #dsma members’ identities were either not related to diabetes or unknown based on their Twitter profile information. The majority of individuals tweeting with #dsma had type 1 or type 2 diabetes or were caregivers. A very small percentage of individuals were health care professionals, and there was less company and health care stakeholder participation than with the general diabetes-related tweets. Table 2. 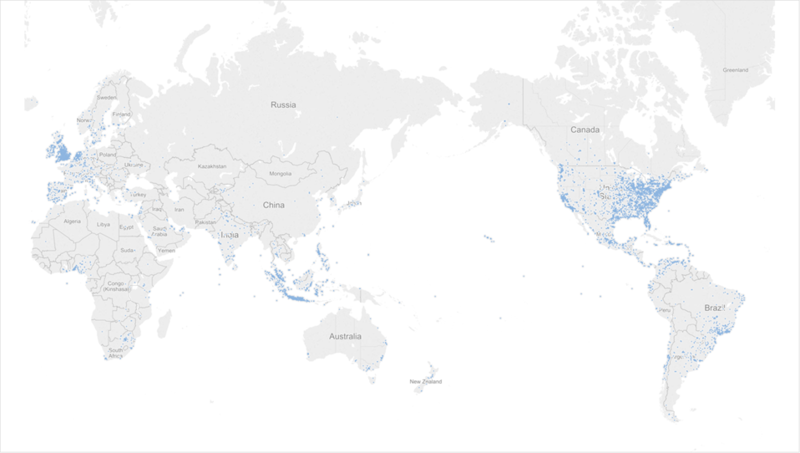 Frequency of the geotagged diabetes tweets in countries with more than 100 appearances. Table 3. Categories of individuals who tweeted with diabetes-related tweets and #dsma tweets. Figure 1. Timeline of tweet volume for all diabetes-related tweets. Figure 2. Timeline of tweet volume for tweets using the hashtag #dsma. Figure 3. The proportion of tweets by month across the 2-year period for all diabetes-related tweets. Figure 4. The proportion of tweets by month across the 2-year period for #dsma tweets. Figure 5. The proportion of tweets by day of the week across the 2-year period for all diabetes-related tweets. Figure 6. The proportion of tweets by day of the week across the 2-year period for #dsma tweets. Figure 7. Visualization of diabetes-related tweets with geolocation information. Each blue dot represents one tweet. We describe the frequency, timing, and location of diabetes-related tweets on Twitter using a large comprehensive dataset of 10% of all tweets over a 2-year period. The large and increasing volume of tweets demonstrates that social media is a growing and robust medium where communications related to diabetes are taking place; in addition, the location of tweets indicates that they are happening at a global scale. In terms of participants on Twitter, we did not identify clear diabetes stakeholders from our random sampling of users from the pool of all diabetes-related tweets. However, when we focused on users from the #dsma community, we did find a significant proportion of patients with type 1 diabetes represented, demonstrating that they are using the medium and hashtag to communicate with a larger virtual community about diabetes during their weekly tweetchat. We found that a very small percentage of participants were health care providers, which may be consistent with the fact that #dsma is a patient-focused chat but may also underscore the fact that physicians are reluctant participants or prefer to hide their physician or health care provider identities with regard to social media . Strengths of our study include the ability to extract 10% of all tweets from the Twitter database over an extended time period, the use of geolocated data, and the examination of the identity of participants who are tweeting. However, we must also acknowledge limitations of our study. Because we only had access to a 10% sample, we could not perform social network analysis of the diabetes community on Twitter. We also recognize that there may be limitations with using hashtags to define a community. Twitter is increasingly becoming a space for online conversations about diabetes. Further qualitative and quantitative content analysis is needed to understand the nature and purpose of these conversations. YL and JL conceived and led the study, analyzed the data, and drafted the manuscript. QM, DAH, and KZ made intellectual contributions to the study design and assisted in drafting the manuscript. All authors read, revised, and approved the final manuscript. ©Yang Liu, Qiaozhu Mei, David A Hanauer, Kai Zheng, Joyce M Lee. Originally published in JMIR Diabetes (http://diabetes.jmir.org), 07.11.2016. This is an open-access article distributed under the terms of the Creative Commons Attribution License (http://creativecommons.org/licenses/by/2.0/), which permits unrestricted use, distribution, and reproduction in any medium, provided the original work, first published in JMIR Diabetes, is properly cited. The complete bibliographic information, a link to the original publication on http://diabetes.jmir.org/, as well as this copyright and license information must be included.